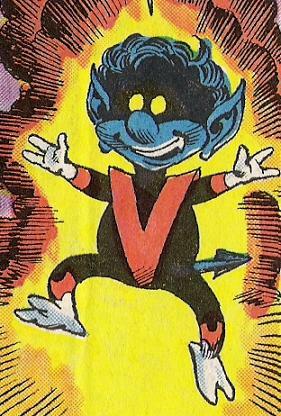 Before you get confused by the title, I am aware that the term bamf is used when Nightcrawler teleports. However, I have recently started reading All-New X-Men: Inevitable, and there is a character there that is referred to as 'a Bamf'. The character is named Pickles, and appears to enjoy eating pizza and drinking beer. So, my question: what is a Bamf, and when were they first introduced? On Earth-616, in the first Nightcrawler limited series in 1985, Nightcrawler is sent to the same universe as these creatures and encounters the bamf that helped Kitty pride in the original Uncanny X-men #513, and ends up discovering that the females are larger than the males, more alike to himself. 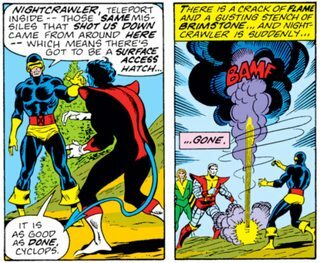 The term bamf originates with the sound Nightcrawler made when he teleported. What happened to Professor X? What made Shaw's room on the sub telepath-proof? What happens to parts of Mystique that are cut off? What is the full extent of Cypher's omnilingualism? Who or what is Doop? What can Professor X do to a dead body?